The global communication revolution that has been enabled through massive data transmission within photonic networks has had a tremendous impact on people’s lifestyle and modern industry. Over the past two decades, high-speed optical links have been successfully applied to various systems ranging from long-haul transmission lines to short-haul communications within buildings. The tremendous growth in the demand for high data rates in photonic networks encourages exploiting the available resources in this medium more efficiently. Much effort has been devoted to quantifying fundamental limits of fiber-optic channels. One of the key devices to establish a high-bit-rate photonic signal processing system is a photonic switch which functions with an ultrashort delay time. 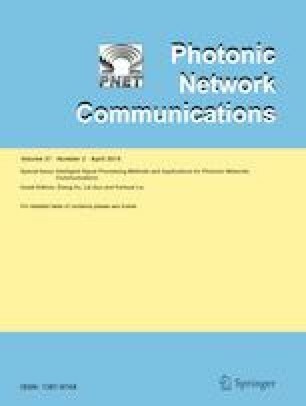 The idea of using photonic networks to replace present-day electronic switching fabrics was initially driven by the power hungry nature of the optical to electronic and electronic to optical conversion. Additionally, there is a speed limitation for the electronic interconnection which typically employs millions of closely spaced metal wires in the state-of-the-art computer systems. A photonic switch that controls optical signals directly by another light beam with potential recovery times in the pico- or femto-second regimes has the capability for terahertz switching speed. The availability of such a component, combined with the use of low-loss optical waveguides and fibers, would provide a promising step toward high-speed and low-cost photonic networks at short distances. Indeed, the more severe signal-dependent nonlinear effect in photonic channels, compared to wireline and wireless channels, makes the channel modeling and capacity analysis of these channels cumbersome. The recent progress in channel modeling and capacity analysis of photonic channels have opened a new horizon in the design of data transmission schemes operating with higher spectral efficiencies than current systems. Fang  presents a master–slave wireless network monitoring system by integrating ZigBee and GSM technologies. The detected gas status from the remote detection unit can be transmitted to master monitoring station via self-organizing ZigBee network. Sun et al. propose several pneumatic control schemes implemented with proportional and PWM-solenoid valves to achieve optimal control for pneumatic soft actuators adapted to different soft robots, such as soft gripper and soft humanoid hand. The block-sparse structure is shared by many types of signals, including audio, image, and radar-emitted signals. This structure can considerably improve compressive sensing (CS) performance and has attracted much attention in recent years. However, when fitting this model in practical applications, the nonzero blocks are always separated by one or more zero blocks to avoid interference between active emitters. (Generally, a block is occupied by an emitter.) Tian and Wang  coin a new phrase, ‘nonadjacent block sparse,’ or NBS, to describe this new structure. Wang and Zhao  study the HWSN reliability evaluation based on IoV perception layer and utilize the object-oriented colored Petri net as the modeling tool for HWSN. On the basis of this model, this paper further explores the definition of HWSN reliability evaluation quantification and proposes a new approach to HWSN reliability evaluation quantification. Li  use the lexicographic product method to construct a larger digraph from several specified small digraphs. The digraph constructed by this way can contain the factor digraphs as subgraphs and preserve many desirable properties of the factor digraphs. Wang et al. present a SEMG segmentation algorithm based on signal envelope and integral electromyography. Compared with manual segmentation, the coincidence rate is more than 90%. The one-way Hash is used by Xu and Yuan  to realize the mutual authentication between RFID tags, readers, and application servers. Meanwhile, to solve the tracking attacks of tags, the ID update ability is proposed. The IDs of the RFID tags used in this protocol are variable and traceable. A new hybrid intrusion detection model which combines the distributed and centralized strategies is proposed by Shang et al. . Song et al. present a novel node deployment scheme, which is based on evidence theory approach and caters for 3D USWNs. This scheme implements sonar probability perception and an enhanced data fusion model to improve prior probability deployment algorithm of D–S evidence theory. Considering the intermittent characteristics of distributed energy, for reducing network loss, the effective option is to control error and response speed directly through the upper control, when distributed energy accesses on dc distribution network, which is no need to change grid topologies, run cumbersome power flow algorithms, nor add additional equipment. A reducing network loss method is proposed by Han and Li  based on this idea. Chen et al. proposed the nonlinear masking method to apply to the traditional items and used the iterative learning control algorithm to decrypt. The algorithm reconstructed the information signal completely and analyzed the robustness and convergence of learning algorithm about the initial error and output error. The convergence conditions were given, and the simulations show that the algorithm can reconstruct the signal in communication secure. Based on the partition scheduling model, we introduced the loss packet period of the time-triggered (TT) data flow and the correction parameter of rate-constrained (RC) data flow and then optimized the model of service curve and arrival curve of a certain RC data flow. The delay performance of RC data flow is analyzed proposed by Wang et al. . The guest editors would like to thank Prof. Byrav Ramamurthy who is the editor in chief of Photonic Network Communications. His help and trust is the most important thing for the success of this SI. The guest editors would like to thank the reviewers for their high-quality reviews, which provided insightful and constructive feedback to the authors of the papers.